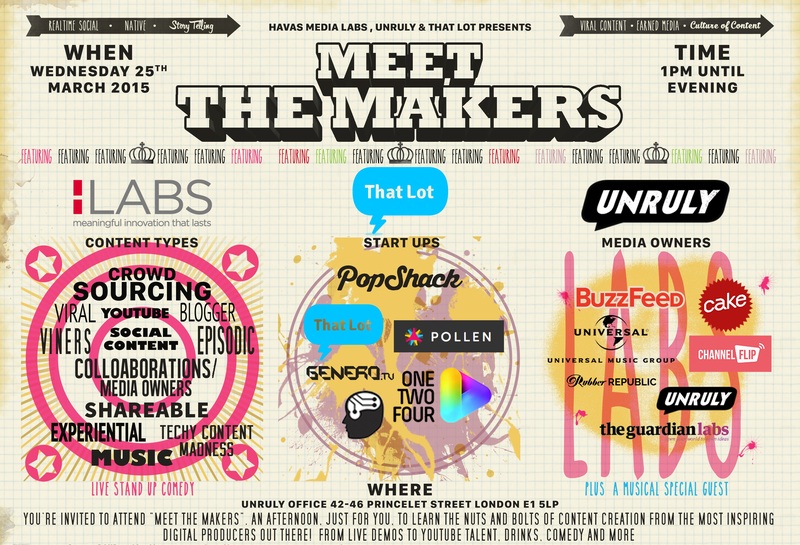 On Wednesday 25th March Havas Media Labs, That Lot and Unruly teamed up to organize a truly exciting tech festival called “Meet The Makers”, which took place at the wonderful Unruly’s headquarters in the midst of Shoreditch, London. The idea behind the event was that of an afternoon during which established agencies, start ups and more generally digital content producers from a wide variety of sectors were able to showcase their services and products to interested folks with the help of live demonstrations, informative sessions and even live sketches. I had the great pleasure to attend the festival and the experience did certainly not lack highly interesting stimuli coming from the kaleidoscopic realm of digital technologies. Probably out of a personal positive bias towards music and arts in general, what provoked the most thought in me, while navigating between unbelievable demos of projects involving augmented reality to bring customers’ interaction to the highest levels and truly fascinating insights from professional Viners, was actually the current enormous influence of digital technology onto the art production process, particularly music. I’m not referring here particularly to concrete digital tools and simulated instruments that can generate music themselves, but rather more to whole new horizons of feasibility where music creation and distribution meet with emerging affordances of digital technologies. For so many years now we’ve been hearing from all directions that the music industry, with particular emphasis on record labels, is on its one-way journey to the cemetery and that music, in many ways, is becoming totally devaluated because of free downloading or the exploding usage of streaming services on the part of listeners. Although there certainly have been huge changes and developments in that regard, the enthusiastic presence at Meet The Makers of digital agencies such as Universal-supporting “Globe”, video community platform “Genero.tv” as well as brand new forms of labels such as “PopShack”, fully demonstrate that a relatively new, self-emerging set of collaborative intersections have strongly arisen since the digital takeover of the creative industries. What counts here, in my opinion, is not necessarily how exactly to define or tag such new sets of services within the music industry – the discussion on which term suits their practices best among “music specialists”, “music strategists” and “entertainment networks”, to name just a few, could arguably be a very long one –, but rather that these new players have been able to take up the potential of the latest developments in digital technologies, adding to them a genuine touch of business vision in order to proactively react to shrinking businesses of an industrial segment undoubtedly in crisis. By fostering connected and collaborative communities through social media such as YouTube as well as creating unexpected partnerships between brands and artists, hybrid forms of content, or even counter-intuitive opportunities in previously unexplored territories, a number of such firms have apparently succeeded in transforming into valuable outputs something that for very long was seen as (commercially) lost: music compositions. According to verbal answers received directly form professionals present at the festival, artists and their managements are now fully aware of these new kinds of possible partnerships and services, therefore it could be reasonably said that the market has already established itself and is thus ready to further flourish. Also, the same practitioners who were at “Meet the Makers” really wanted to emphasize that – obviously, I would say – the decision on whether to embrace the partnerships, collaborations, and projects suggested by these digital agencies and labels still fully resides in the hands of the artists themselves, hence demonstrating that everything happens theoretically on a consensual and “artistically” agreed basis. After all, the music world still remains a business of some kind, and it probably was only a matter of time until new forms of valorization would have started to promote again the most fundamental unity of capital of such market, the music itself. The necessary question here would be whether this new direction the music industry and the entertainment sector in general are taking is something worth the many compromises that go along with it. Surely, the authenticity and artistic ingenuity that have for so long been able to craft wonderful musical products from their conception until their release before the advent of an all-encompassing influence of digital technology should be totally reconsidered to say the least. Yet, what other real possibilities are there to react to the fundamental changes brought by digitization to the music and art sector? Honestly, the “make everything available for free” and “abolish all copyrights and monetary incomes” claims do not appear reasonable enough to me, at least on a short-term basis. It seems as if a possible path to undertake has slowly been found and is apparently accepted by the majority of relevant stakeholders as a more or less sustainable solution in order to restart to churn out great tunes from the actors of the music business. One thing is for sure: in the credits for this new conceptual meta-album, now more than ever, digital technologies should not go unmentioned.